Because he can invent just about anything to make the world a little better, folks call him INVENTOR MCGREGOR. In between his work, he likes to stroll down the winding lane behind his house, where he sings a snippet of a song, paints a picture, and twirls a whirl of a fling. Kathleen’s guides assist readers to a deeper understanding of concepts in her books with activities such as games, puzzles and discussion questions. …a delightful tale… Not only is Inventor McGregor one of the best books I’ve ever read on creativity, it’s a story that I hope becomes one that influences a generation of young readers to opt for the joyfully jobless life. I’m going to donate a copy to my grandchildren’s personal library right away. Even if you don’t have a child to read it with, find a copy and treat yourself. After all, it would be a shame to miss a story that’s as wise as it is whimsical. 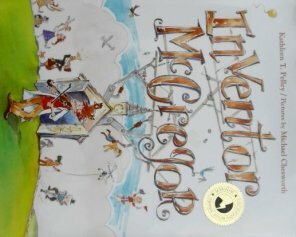 In an uproarious picture book… Preschoolers will love the nonsense of the contraptions, beautifully captured in the sound and the rhythm of the storytelling, with short, sharp sentences about how McGregor fixes squeaky skates, wobbly wagons, tangled kites, knotted yo-yos, headless dolls, and footless soldiers. The wild, double-page watercolor spreads celebrate the farcical gadgets the inventor uses as they show the gluing and oiling and hammering of his work and his joyful home. The sprightly pastel drawings are as lighthearted as the text, which bursts with creative energy. Pelley is a native of Scotland, and her text is peppered with colorful expressions… There is a natural lilt to the language that lends it a folkloric quality… This charming tale could be coupled with Uri Shulevitz’s The Treasure (Farrar, 1979) for a discussion of appreciating what lies directly in front of you.